En 2012, las Monedas de Plata A Prueba Serie II Lunar Australianas de la internacionalmente renombrada Casa de la Moneda de Perth celebran el Año del Dragón, el quinto animal en el ciclo de 12 años del zodíaco chino. These superb proof quality releases are perfect for people born in "dragon" years - 1940, 1952, 1964, 1976, 1988, 2000 and 2012 - who are regarded as confident, enterprising, independent, self-assured, brave and passionate. The reverse of each coin depicts a traditional Chinese dragon, a long, scaled, serpentine creature with four legs, and a "pearl of wisdom". The Chinese character for 'dragon' and the inscription "Year of the Dragon" also appear in the design with The Perth Mint's traditional "P" mintmark. 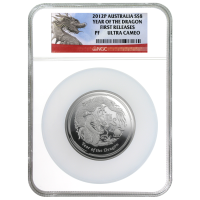 Moneda de Plata Ultra Cameo NGC PF-70 Año Lunar del Dragón 2012 de 5 oz de la Casa de la Moneda de Perth Claim this rare find when you purchase a 5 oz 2012 Perth Mint Lunar year of the Dragon NGC PF-70 Ultra Cameo silver coin from our online store. This already stunning, pieces not only comes with a certificate but is also rated with a proof finish of 70 by the Numismatic grading Corporation making this a stunning piece. En 2012, las Monedas de Plata A Prueba Serie II Lunar Australianas de la internacionalmente renombrada Casa de la Moneda de Perth celebran el Año del Dragón, el quinto animal en el ciclo de 12 años del zodíaco chino. These superb proof quality releases are perfect for people born in "dragon" years - 1940, 1952, 1964, 1976, 1988, 2000 and 2012 - who are regarded as confident, enterprising, independent, self-assured, brave and passionate. The reverse of each coin depicts a traditional Chinese dragon, a long, scaled, serpentine creature with four legs, and a "pearl of wisdom". The Chinese character for 'dragon' and the inscription "Year of the Dragon" also appear in the design with The Perth Mint's traditional "P" mintmark. As well as appealing to silver proof coin collectors, this outstanding release also makes a great gift for people born in any year "ruled" by the Chinese lunar dragon.